Is now the time to Invest in Gold? If the stock markets plunge and the world economy becomes compromised, one hard asset normally has its moment to shine in the spotlight. 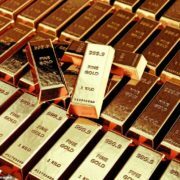 In recent weeks, as markets worldwide have corrected sharply and a full-blown trade war between two of the globe’s powerhouses – the United States and China – looks increasingly likely, the gold price has rallied. From a year low in August of $1,180.40 an ounce, it rose to $1,233.85 by the end of last month before falling back slightly and then rising again to $1,232. Although the price remains lower than it was this time last year, there are some investment managers who now believe gold has a key – if minor – role to play in putting together a diversified portfolio. One such individual is David Coombs, head of multi-assets at investment house Rathbones. Normally sceptical of gold as an asset class, he has built a three per cent holding in the £532 million Rathbone Strategic Growth Portfolio that he manages – a fund aiming to provide investors with returns in excess of inflation. It does this by investing in a broad range of assets including equities, bonds, private equity and commodities. ‘My long-term view on gold has not changed,’ says Coombs. ‘If you like it, wear it and don’t invest in it. Gold provides no income which is a big ‘no no’ for many investors, especially when interest rates are on the rise and cash and bond yields become more attractive. According to Coombs, the hedge is against the threat of ‘stagflation’ [economic stagnation combined with inflation] triggered by a Brexit deal not being done. Investment trusts Personal Assets and Ruffer both have exposure to gold. Like Coombs’ fund, both Personal Assets and Ruffer are broadly diversified and are designed to maintain the real value of investors’ holdings. Personal Assets currently has eight per cent of its assets in solid gold (bullion) while Ruffer has seven per cent exposure through shares in gold mining companies. Jason Hollands, of wealth manager Tilney, says some of the portfolios it runs for private clients have around two per cent exposure to gold. He says: ‘We do not see gold as a low-risk asset per se. Gold prices have at times endured long losing streaks and out of the last five consecutive 12-month periods, four have seen the gold price fall. ‘Also, a strong dollar is not good for gold because it means the currency is seen as a safer haven. Indeed, a strengthening dollar is often accompanied by a weakness in the gold price. The cheapest and most straightforward approach is to buy an investment that tracks the gold price. These are called exchange traded funds . They can be bought through a stockbroker and most fund platforms. Physical gold (bars and coins) can be bought from bullion dealers – Buyers can ask to have it stored, for a charge, or delivered. https://www.forshawcapitalgroup.com/wp-content/uploads/2018/11/gold-bullion-e1541372239397.jpg 489 600 admin https://www.forshawcapitalgroup.com/wp-content/uploads/2017/12/Forshaw-capital-300x113.jpg admin2018-11-04 23:00:242018-11-04 23:00:24Is now the time to Invest in Gold?